Tis the season for knitting! It’s December 8th, and that means only 17 days of knitting ’til Christmas. Time to think thick and quick! Urban Yarns has a GREAT selection of bulky yarns and patterns to match that you can knit up in an evening or 2. Malabrigo Rasta has to be my very favorite bulky yarn. I have used it to make a few False Creek Cowls this year and there is always the lovely Marian Cowl. Marian has been a huge hit around the shop for a few years now, never going out of style and always flying off the needles. Blue Sky Alpacas Bulky is another great thick and quick yarn. It’s a super soft combination of alpaca and merino, perfect for a hat or scarf, anything next to the skin. 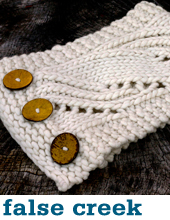 The Trellis Scarf is a glamorous long scarf with a trendy fringed edge, while the Frosty Cowl (which takes just 2 hanks!) is a closer fitting cowl.